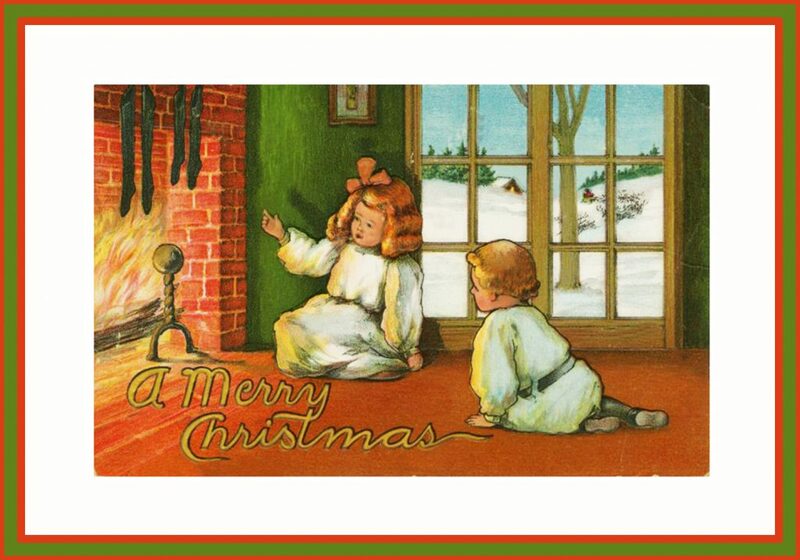 These wonderful Vintage Christmas cards are from a time that has passed, but they are still colorful and charming, and they practically oozes of Christmas and cosiness. When I found these old Christmas cards they were kind of faded and scratched, and very authentic. But I think if they should be used for anything else than remembering an earlier period, they needed to be restored, so that is what I have done. I would so much like them to be used today, either as a real xmas postcard, or as a Christmas greeting in a mail. Click the card you like, and see the actual size in a new tab. After saving them to your computer you can write your own Christmas greeting or message on the card, or you can just print it as it is. 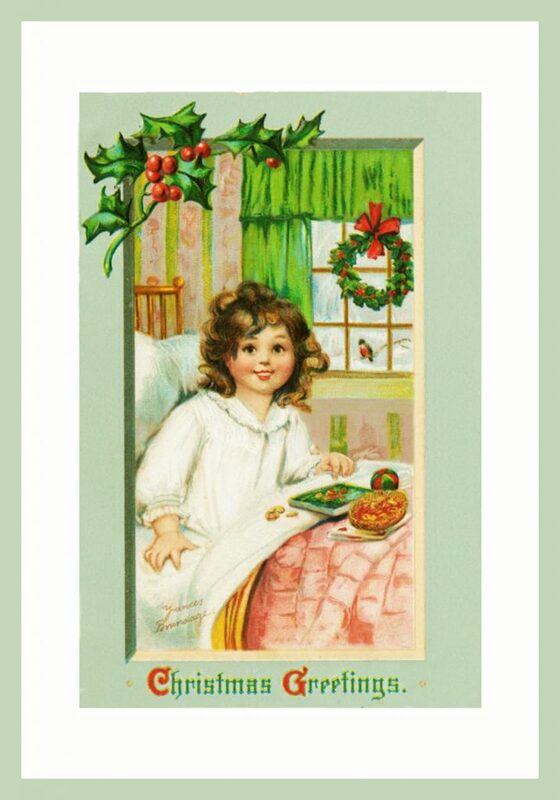 Take a look to find one (or more) you like, or go to the other page here with Christmas cards. A charming scene, with two children clearly dressed up for the Christmas, discussing what might be in their Christmas stockings the next morning. Outside the landscape is snowy, and it makes the idea of sitting in front of the fire even more appealing. 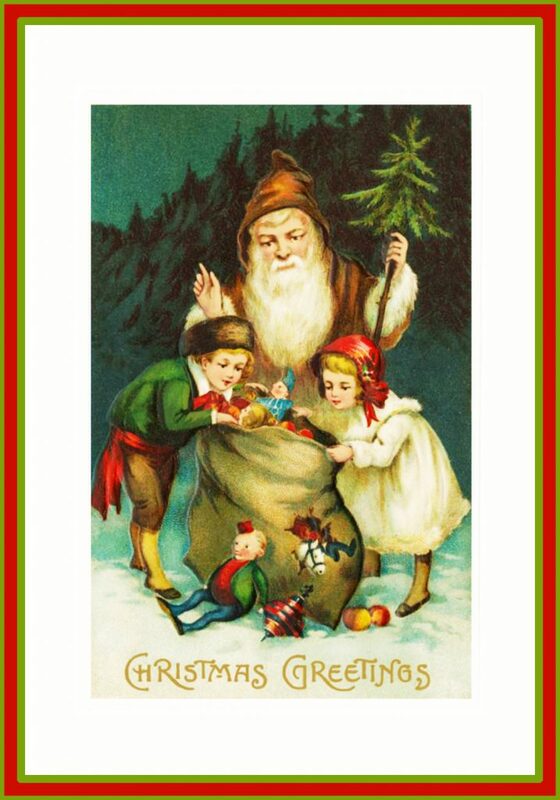 First an old Christmas card with Santa and two kids that simply cannot wait to see what is in his sack. Actually the sack is to full of presents that they fall out of a hole in the sack, so maybe Santa needs a little help there. Santa also brings a small Christmas tree. 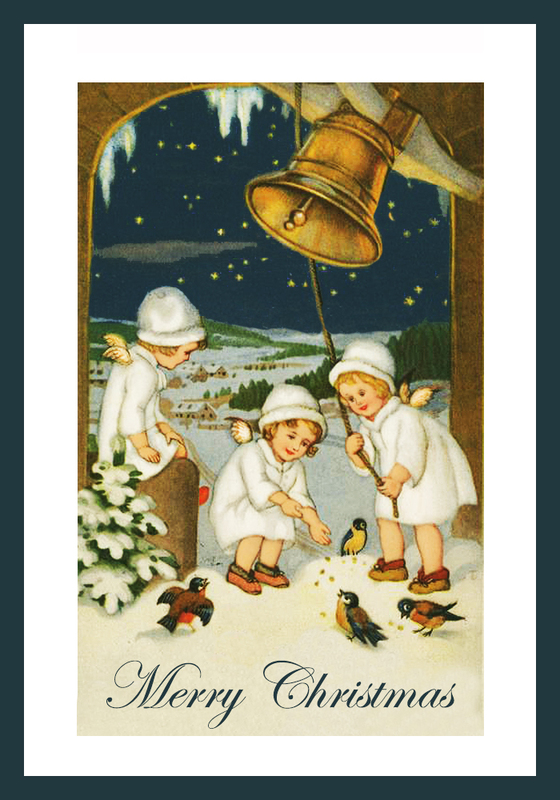 Next xmas postcard is with three cute little angels feeding the wild birds, and ringing the big bell at the same time. The night sky is filled with stars, and th icicles are hanging from the roof. 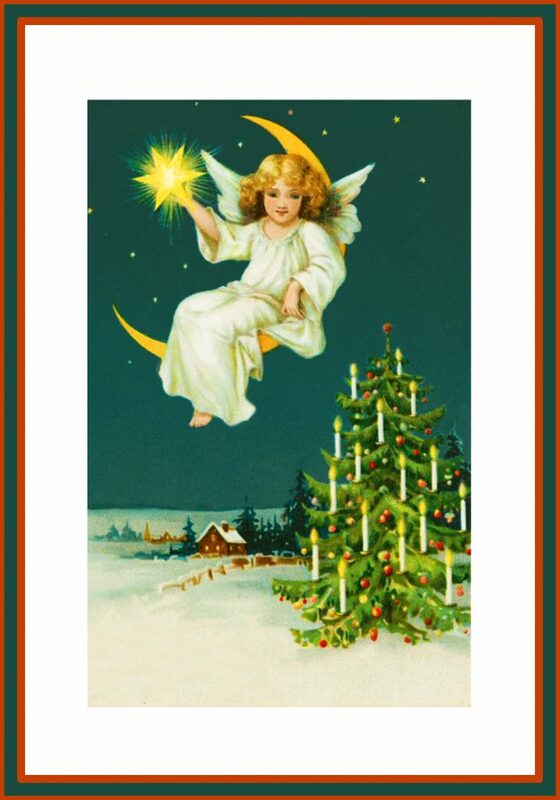 A xmas postcard with an angel sitting on the moon and holding the Christmas star. Below the moon is a snowy landscape with small houses, and a Christmas tree. 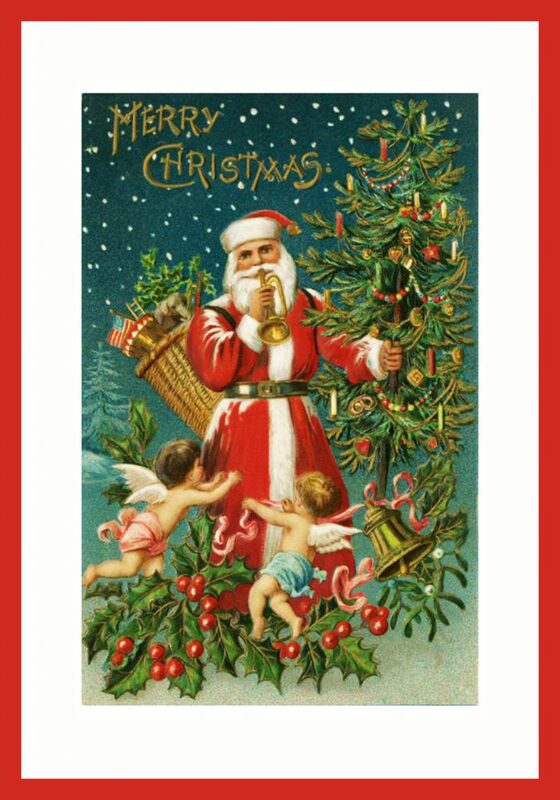 Then there is another Christmas card to print with Santa blowing a toy trumpet, holding a Christmas tree, and carrying a basket with gifts and a small American flag. Two small angels are around Santa, tying a bow with a Christmas bell around him. 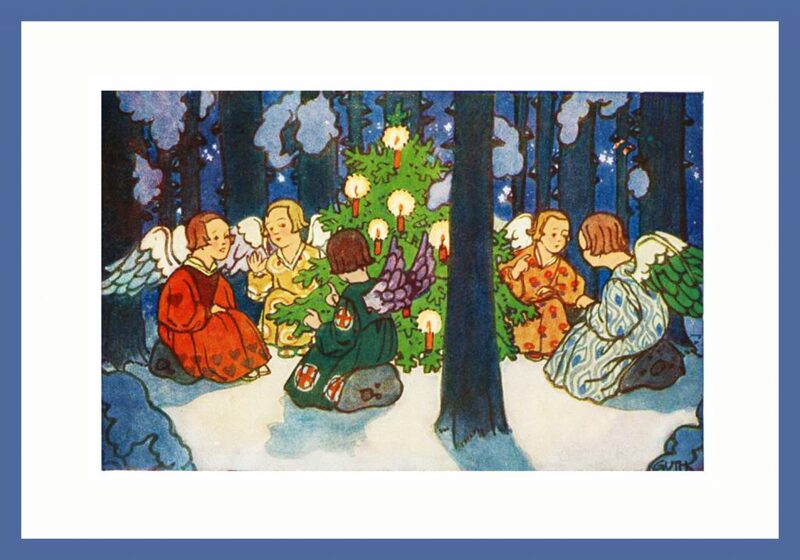 This wonderful Christmas card to print is with small angels having a meeting in the snowy forest around a Christmas tree with lit candles. It’s Christmas morning, and the little girl wakes up to wonderful presents. In the window is a wreath made of holy with red berries, and outside the window is a robin sitting on a branch in the snow. 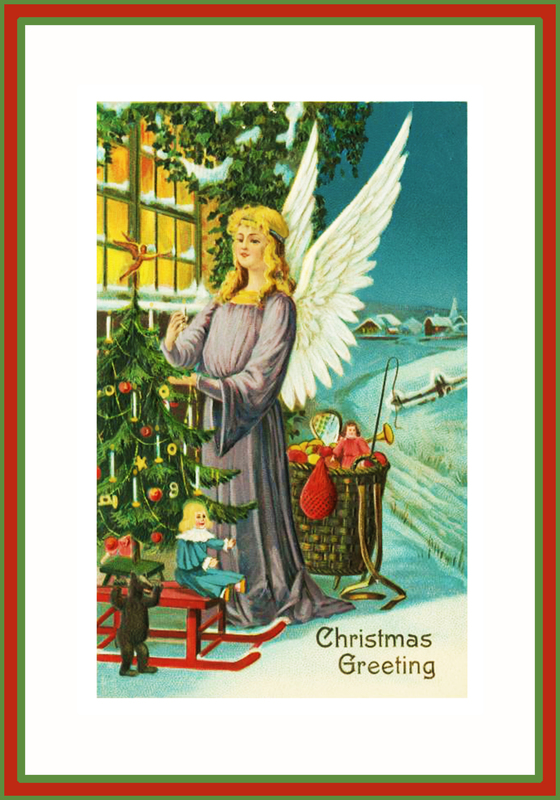 The next of the Vintage Christmas cards has the motive of an angel decorating the Christmas tree in the snow. She must be helping Santa Claus, because she seems to carry a basket with Christmas presents. 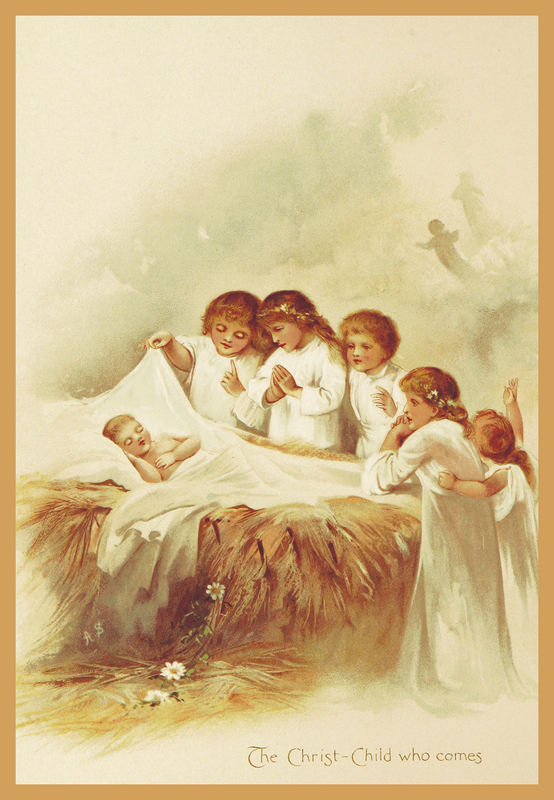 The last card is with the motive of the newborn Jesus surrounded by cute angels. Yet another of these cute Christmas cards to print with little angels. 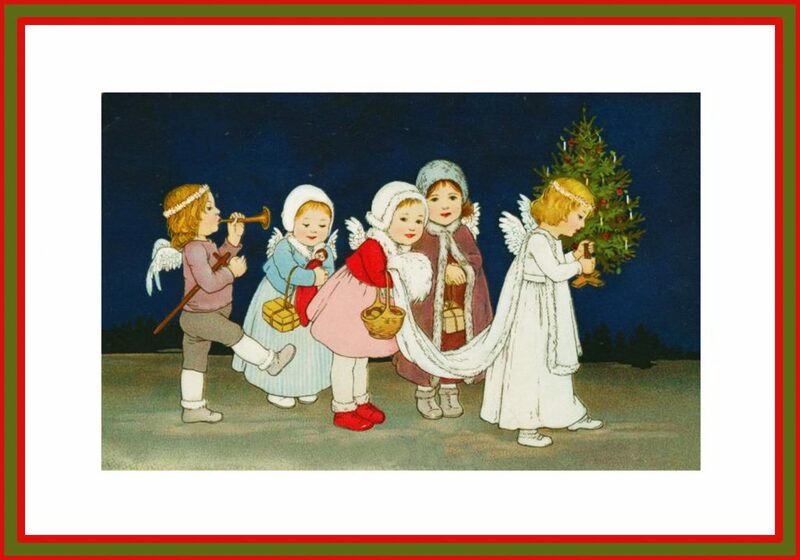 One of the angels is blowing a trumpet, others are carrying gifts and baskets, and the cute Lucia angel in front is carrying a Christmas tree with decorations and candles. 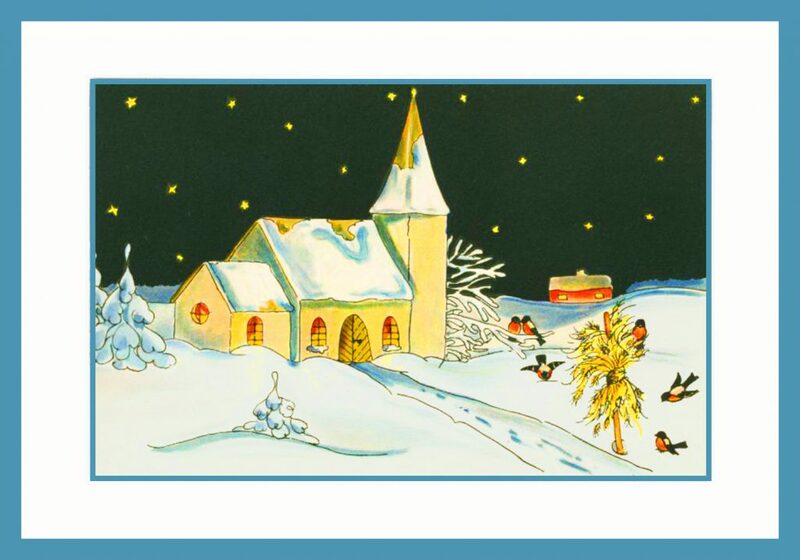 Finally, at least for now, the last of the free x-mas cards, a church in a snowy landscape. You can see from footprints in the snow that people have come to the church for the Christmas church service. Outside in the snow there is a sheave for the robins.